Prints are a very personal thing--subtle differences can cause you to love one pattern and hate another. I tend to dislike anything too extreme--dainty florals and funky geometric prints equally turn me off--but I almost always love anything created by Marimekko, the Finnish textile company. Marimekko's patterns range from pop floral prints to beautiful abstract florals, and even their recent designs have a retro feel. And while Marimekko-inspired prints often turn up in the world of interior design, for spring, they hit the runways. 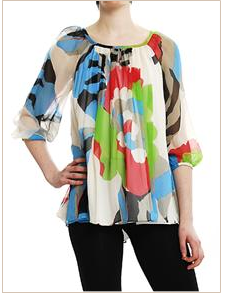 From dresses to tops, these bold retro prints are a fun, easy way to inject some color into your wardrobe. 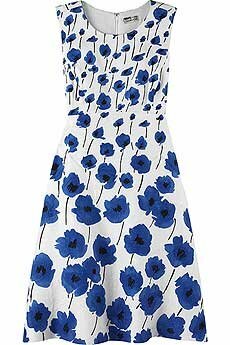 This Oscar de la Renta poppy-print dress is a very literal Marimekko reference, and is sure to be knocked off from here to Forever 21. It's so feminine and classic, you literally can't go wrong. If floral prints are too girly for you, this Stella McCartney print dress has a simple mod pattern in cool, soothing tones. The belted shape is also great if you're not into spring's super-loose dress silhouettes. I love this Temperley Carribean cotton dress, because the shape and the color scheme are so vacation-y--even if you're back at work, you can close your eyes and pretend you have an umbrella drink in your hand. The cut looks nice and comfy too. 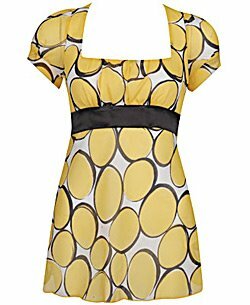 I think T-Bags, in spite of its kinda-gross name, has some awesome prints, and this halter dress is no exception. It comes in several groovy patterns, but I love this purple print the most because it looks like something from Biba, the chic early-'70s London rock-chick boutique. Tibi is another line known for its vivid prints, and from the bold colors to the easygoing, summery shape, the Thebes top doesn't disappoint. Plus, anything that evokes a Greek goddess is alright in my book. I don't know what it is about this Issa London kimono dress that I love so much, but the print is just so appealing to me, perhaps because turquoise and bright yellow is not a combination you see every day. I think if this dress were about three inches longer, it would be perfect; for tall gals such as myself, leggings might be in order. I've never had much of an opinion about French Connection (well, I used to have one of those "fcuk" T-shirts about 8 years ago, but who didn't? ), but starting with their sequin-stripe minidress last fall, I began to take notice. 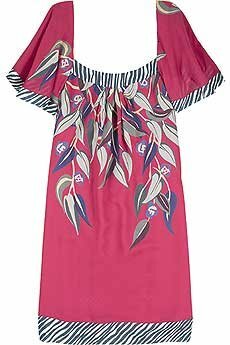 And this psychedelic Love Bug tunic--strangely, kind of ugly and cute at the same time--is definitely holding my attention. What with all the uber-hip 18-year-olds and overcrowded racks, I routinely come close to having anxiety attacks in Urban Outfitters stores. But I can certainly handle the relative serenity of their website, especially with cute things like this geometric-print cami, for a mere $24. Nine times out of ten, when I ask someone at work where they got their cute outfit, they say Forever 21, and that it cost like $12. I try not to think about the third-world factory workers being exploited in the process, but with awesome things like this chiffon polka-dot top, how can you not shop there?